Joining letters improves everyday handwriting and increases handwriting speed! Joined up writing is just what it sounds like. and make words easier to read and write. The simple style you'll learn right now is fast and fluent. Since letters are joined up, you can write more quickly, and because your pen leaves the paper less often, you can write more fluently. You simply use a familiar form of print writing you've used for years, and only join letters that link up naturally and easily. Think of the writing you see most of the time. Common fonts are similar to the print writing we learned in school. Why? Because they are easy to recognize and read. Why are we asked to print when filling in forms? For the same reason most fonts we read are a printed style. Those letters are so uniform they can be read easily by machines. A joined up writing style with no slant, having letters that closely match print or manuscript forms, will be consistently neat and easy to read while also being quick to write. Forget about what you learned in school! Joined up handwriting that is neither cursive nor manuscript, is actually a hybrid form that's a cross between print writing and typical cursive handwriting. This hybrid form is the most practical and efficient form of handwriting. What's more, you can completely personalize it, and make it your own. Would you like to join the growing number of people who now use a hybrid handwriting style? If you aren't already using a hybrid style of writing, maybe it's time you did! A handwriting style that is familiar to the eye can boost your ability to spell and read. When words look as familiar as the face of a friend, less thought is needed to read and spell them. Your brain can create a familiar and memorable image of a word, so you read, write and spell with less effort. There is less opportunity for any kind of handwriting these days. So a little practice with this fast, efficient handwriting style can sharpen your skills and prepare you for all occasions when nice, neat, quick handwriting is required. This hybrid style is in fact, the perfect handwriting for everyday. Your signature and works of art may contain more elaborate and creative letters, but you'll want to use this simple type of lettering most of the time. Imagine writing so neatly you feel like you're tracing someone else's perfect handwriting! I can help you practice joined up handwriting so using it quickly becomes a habit. You'll soon feel as if your hand has an invisible guide when you put pen to paper! Remember why you're joining letters! You're linking letters within words so you can write more quickly while still writing easily, neatly, clearly and consistently. So don't go crazy! You'll want to make as few changes to letters as possible. Consider the whole word, not just individual letters. For example, the word 'the' is the most common word of all. 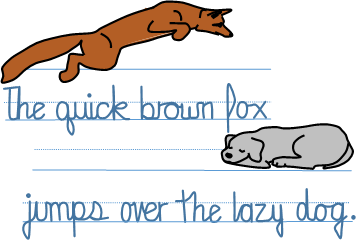 It may be quicker to write if you pause to cross your t, before joining to h.
Compare the advice given above to the hybrid style (blue), and the typical cursive style (brown) below. How many differences can you find??? Which letter forms do you prefer? To learn more about handwriting and handwriting styles go here: What your Handwriting says about You! Join as many letters as possible, but don't worry about joining every letter. You can sometimes get a more readable word by breaking it in a place where it's hard to create a good join. For example, the letter x is difficult to join from, since your end point in on the inside of the word. In addition, the letter z is difficult to join to, because it begins in an awkward place. Joins begin where the previous letter ends, and end where the next letter begins. In #7 of the Wordskillz™ post How to Change your Handwriting in 10 Steps or Less (if you haven't read the post yet you'll find it here), we looked at letter and word spacing. Keep the same guidelines you learned there in mind when joining letters. So half a letter 'o' between letters within words, and a full letter 'o' between words. Linking letters leads makes handwriting a more fluid rhythmic process. Now you've decided what letter styles you prefer, and what joins you'll need to use, it's time to practice your joined up writing! If you've read # 3 of the Wordskillz™ post How to Change your Handwriting in 10 Steps or Less, you know all the advantages of having a writing style that is similar to print. [Haven't read the post? You can read it here. You can also get the very best lined paper to practice your joins!] You also know that to write quickly you're going to need to link some letters. You've known how to print letters since you were a small child. So you won't need to give much consideration to the formation of letters. Just keep it simple, and let the printed form dominate. But also remember, when you join up letters, you avoid the need to lift your pen from the paper. As a result, you can write more words per minute. Have I convinced you that a hybrid form of writing will tick most of the boxes for you? Any questions? Contact me here! Haven't taken the Wordskillz Handwriting Quiz? You can take it here. Now that you know how to write quickly, it's time to discover if anything else stands between you and nice, neat, practical everyday handwriting.